It’s the Easter holidays here at the Robotic Shed, a time for doing some gardening & pondering the chocolatey eggs to come. However amidst the shocking indolence some forward progress has been made, which, if you squint a bit you might be able to find some proof of in the screenshot above. Mainly, I’ve had another pass over the game’s options menu and finally made sure that everything in there can be toggled on and off during the game as well as before it. I also added a couple of new options; 1) to change the texture quality 2) to toggle v-synch on or off and 3) to rebind the game’s control keys. Usually this kind of thing is fiddled about with at the last-minute in a game’s development but I decided to get it out of the way now as their broken-ness had eventually cracked the deep buried QA tester in me. I’ve also added normal maps to most of the models since the last update and fixed up their shading code. They have to be quite pronounced to be actually visible at the game’s camera distance but I think it improves the look of things like the stone walls and tiled floor quite a lot from some angles. Normal maps were the last significant piece of the game’s graphics ‘tech’ that weren’t working so it’s nice to have them finished and therefore the last steps in the asset creation pipeline nailed down. 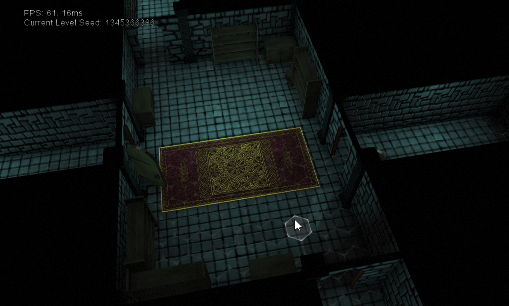 Finally, I’ve added a couple of new object types to the level furnishing mix; a new fancy rug at floor level and a door. The door is animated but is still awaiting a bit of man-door interaction code before it’s a finished thing. I suspect doors are probably going to be the main thing other than enemies that the player’s mercenaries will interact with as they complete a level’s objectives. I’m not sure I’ll match Deus Ex’s impressive number of ways to interact with a door but I’ll at least manage opening and closing. This entry was posted on Sunday, April 17th, 2011 at 20:39	and tagged with graphics, options and posted in Free Company, Programming. You can follow any responses to this entry through the RSS 2.0 feed.